Bánh Mì means wheat bread in Vietnamese - but Vietnamese only know one kind of wheat bread, and that is baguette that Frenchmen took with them to Vietnam under colonial. When you take a bite of Bánh Mì, you will experience a mouthful of the best from both France and Vietnamese kitchen. Bánh Mì come in a variety of flavors, but the basic ingredients are always a baguette, battered daikon/carrots, coriander, homemade meatballs or tofu and of course plenty of flavors - we season with pepper mayo, chili (Sriracha) and soy. Our Bánh Mì is freshly baked every day and the filling is homemade and made from scratch. 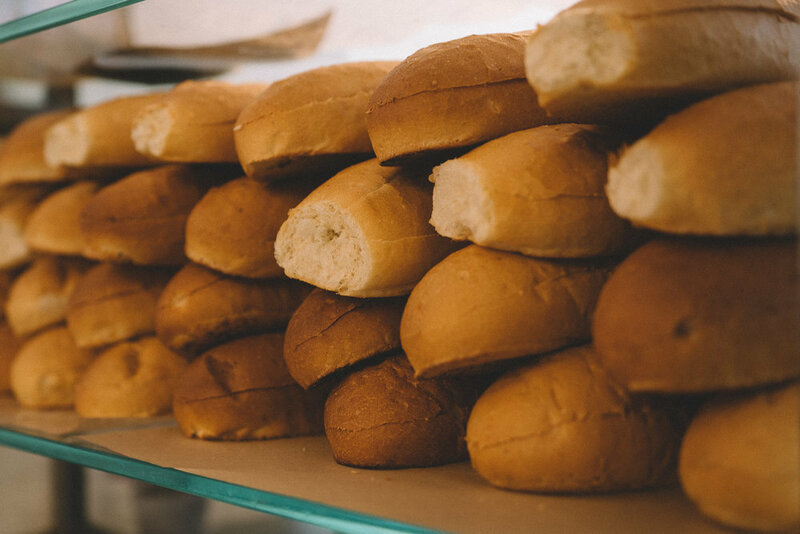 Our Banh Mi is freshly baked and serve with a filling of pork, chicken or tofu. They are smeared with mayo, seasoned with soy and chili sauce and topped with coriander, cucumber and homemade pickles of carrot and daikon. Fresh and delicious with lots of greens and herbs. Comes with fish sauce or soy. We serve delicious beef stew; Bò Kho and over the winter we serve Phở soup, so you can keep yourself warm. Both dishes can be bought as take-out too! Ricepaper rolls w/ rice noodle, greens, herbs and hoisin sauce. Choose between chicken, pork, portobello, shrimps + omelet or tofu.